The best soups have that natural flavor and real chunks of vegetables. 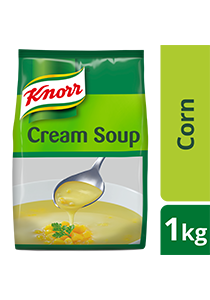 Made with real ingredients, Knorr Cream of Corn is a high quality base that help minimize your food costs. Wheat Flour, Corn-starch, Skim Milk, Sugar, Iodized Salt, Sweet Corn Powder And Corn Kernels, Palm Oil, Flavour Enhancer (Msg), Natural And Artificial Flavours, Turmeric. Chicken soup base. Ideal base for a variety of cream soups. Dissolve 70g of Knorr Cream of Chicken Soup Base Mix into 1L of water. Bring to boil and simmer for 3 to 5 minutes.